While every SourceAudio site comes with your own URL like 'mylibrary.sourceaudio.com', we also support custom domains so you can point any URL you own at your SourceAudio site. Once your custom URL is set up your site will run entirely within your domain and the URL your users see will always be your own. Setting up your own custom URL is primarily a task between you and your domain host. There is a one-time setup fee on our end of $100 and there is a $3/month ongoing fee only because there's a hard cost to us for adding more domains to our DNS setup and security certificate. First thing to note here: a very common first question in this process is, "Please just give me the new DNS coordinates to SourceAudio so I can point our URL at you guys". Just to be clear, that's not what we're doing here. We are updating CNAME records for your URL so that the site is essentially hosted under your own domain, and your domain isn't just simply pointing/redirecting to us. To get started we need you to set up one DNS record with your domain host. Login to your own domain hosting account (GoDaddy, etc.) and set up a CNAME reference for 'www.<your-domain-goes-here>.com' that points to 'web3.sourceaudio.com'. Say you own the URL 'mylibrary.com' and you want your URL for your site to be 'music.mylibrary.com'. You'll simply need to set up your CNAME reference for 'music.mylibrary.com' that points to 'web3.sourceaudio.com'. Please verify that the email address associated to your domain hosting account is one you have access to and check regularly. To verify the email address associated to your account, go here and run a search for your domain: http://www.networksolutions.com/whois/index.jsp . If the email address you see on the results page is one you check all the time, you're ready to go. If the email address you see is not one that you recognize, login to your domain host account and update your info accordingly. When we add your new custom URL to our security certificate an email will be sent to the email address your domain host has on record asking you to approve this request. We cannot dictate where this email goes. It has to go to the email address associated to your domain host account for security purposes. Once steps 1 and 2 above are complete just shoot us an email know and we'll submit the request to have your domain added to our security certificate. Then, you will receive the email from your domain host asking you to approve/confirm the URL settings update and at that point it's all done. 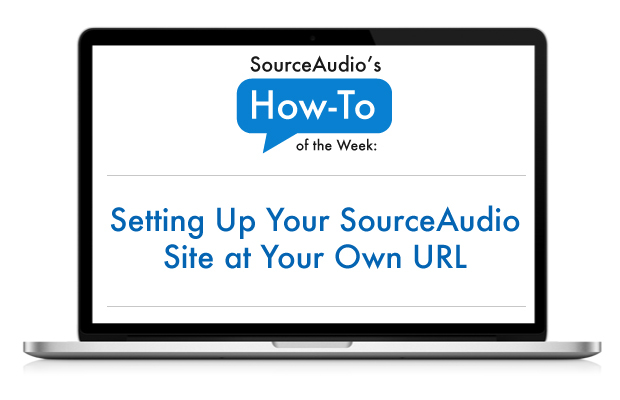 One quick tip: You'll know you've set it up correctly on your end when you load your custom URL in a browser and the page you see looks exactly like this one: http://testing.sourceaudio.com/ . Same white background, same black text - exactly like that very simple looking page. Once you see that you know you're done and we can finish the setup.